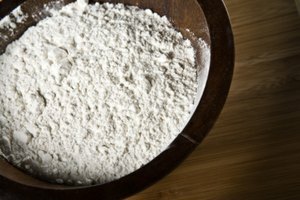 There are many flours and flour products on the market for a reason—each serves a certain purpose. 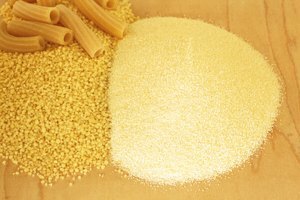 When making fresh pasta or even some breads, you need to know the difference between semolina and durum flour. Both semolina and durum flour are products rendered from milled durum wheat. 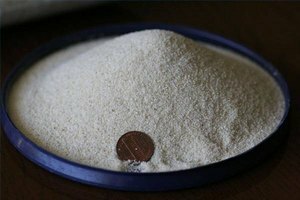 The endosperm—the nutrients surrounding the wheat seeds—is separated from the grain through the milling process, resulting in coarsely-ground flour known as semolina. The texture of semolina is heavier, like hard bread crumbs, and is more coarse than most milled flours. Durum flour is the fine ground powder left over from the milling process and also a product of semolina that's ground further. Durum flour is much finer than semolina, and resembles more traditional baking flours. Semolina and durum flour are both high in proteins and gluten, which make flour very pliable in dough form and allow them to hold up well under heated conditions. The coarse texture of semolina holds pasta dough together and strengthens it when heated. Durum flour's more delicately ground texture creates a softer dough that's forced through pasta makers more easily and bends or curls when cooked. Semolina and durum flour are traditionally used to make pasta, noodles and even some breads with a coarser, harder texture. Semolina allows pasta like rotini, farfalle and macaroni to hold their distinct shapes. Durum flour is used for noodles like spaghetti and lasagna so that the pasta becomes softer and more pliable when cooked. Durum flour's fine grain also lends itself to baking, offering hard wheat textures to breads.